A new video leaked exclusively to Breitbart News Wednesday shows high-ranking Google executives plotting to use their tech resources to thwart the Trump agenda during an hour-long weekly rap session. The video, recorded during a 2016 “all hands” meeting at Google’s headquarters, features co-founders Larry Page and Sergey Brin, Vice Presidents Kent Walker and Eileen Naughton, CFO Ruth Porat, and CEO Sundar Pichai. 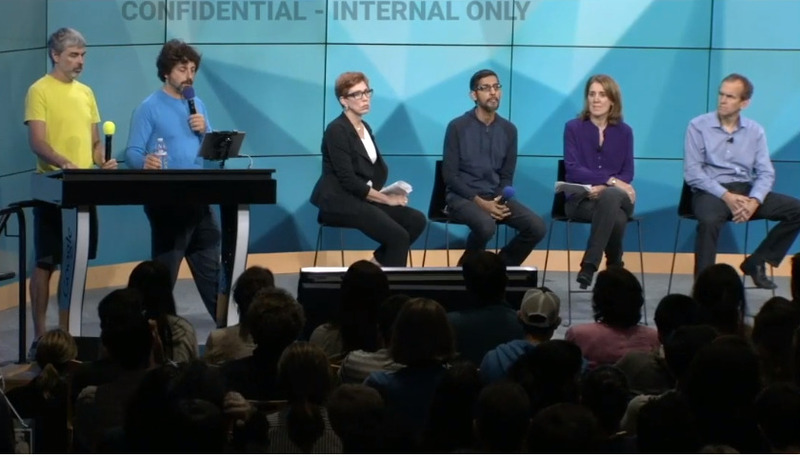 Naughton, meanwhile, assures Google employees in the audience that the company’s policy team in the nation’s capitol is “all over” the immigration issue and will continue to “keep a close watch on it,” later discussing options with employees who wish to leave the country. “Fear, not just in the United States, but around the world is fueling concerns, xenophobia, hatred, and a desire for answers that may or may not be there,” Walker says at one point during the meeting. The video was recorded shortly after the 2016 presidential election, and can be viewed in full at Breitbart News. “All of the speakers assume that every Google employee is a Democrat and is stunned and horrified that Hillary Clinton—the worst and most corrupt presidential candidate in modern history—lost. There is much discussion about what Google can do to reverse the benighted world-wide tide exemplified by Brexit and Trump election,” Hinderaker writes. Trump Campaign Manager Brad Parscale demanded that Google “explain why this isn’t a threat to the Republic. One more piece of proof that Congress and the DOJ need to get off they’re rears and protect the rights of the American Citizen here. Approximately 62 million people voted for the Trump agenda, WHO do these people think they are that they have the right to thwart the will of the electorate? We need to ALL call our Congressmen and Senator’s and DEMAND action against these Narcissist anarchist’s.